Brakes notched a sixth straight Southern League Premier Division victory to retain their place at the head of the table, but they were pushed all the way in the second half by a Hayes & Yeading side playing their first league match under new joint-managers Richie Hanlon and Paul Hughes, writes Paul Edwards. Having picked up 19 points from a possible 21, Leamington were expected to pick up three more against a side third from bottom in the table, but the reality was not so straightforward and made for an entertaining contest, particularly after the interval. Ryan Rowe fires home Leamington's second goal of the afternoon. Hanlon and Hughes had enjoyed great success at Kings Langley, steering the Hertfordshire club from Step 5 to Step 3 in successive seasons and they had quickly set about making their mark, introducing five debutants for the trip up the M40. They were backed by a small but noisy band of supporters who would have taken great heart from their team’s display. Ryan Rowe turned well inside the penalty area to send a shot bouncing just past the post early on, while one of the Hayes & Yeading new boys, Mitchell Weiss, cut inside to fire in a low effort that was going just wide. Tony Breeden pushed it behind to make sure but an offside flag denied the visitors a corner. After a couple of wayward efforts from both sides, Leamington moved ahead in the 17th minute. Rob Thompson-Brown’s dead-ball deliveries were spot-on all afternoon and after Ahmed Obeng was fouled on the left, he delivered a dangerous cross into the six-yard box which could have been diverted home by any number of players. Unfortunately for Hayes & Yeading it was their skipper Tom Broadbent who got the final touch a couple of yards out. Jamie Hood had a fine chance to quickly double Leamington’s advantage when a corner dropped to him just outside the six-yard box but he hurriedly volleyed the ball way over the bar. The visitors were looking to counter when they got the chance but although they were able to get forward it was evident that they were there was still some bedding in to be done by the new faces. Brakes increased their lead in the 37th minute after Broadbent’s pass to Olu Durojaiye was intercepted by Jack Edwards. 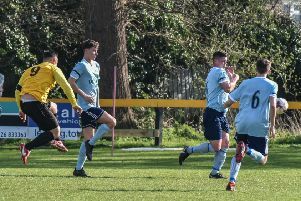 Rowe and Obeng exchanged passes just inside the box before the striker netted his 15th goal of the season, with a deflection wrongfooting keeper Danny Boness. A dangerous corner into the six-yard box from Thompson-Brown saw Obeng’s shot deflected behind, from which Edwards had another effort blocked and James Mace headed just past the post. The visiting players had clearly taken in whatever was said to them by their managers at half-time as emerged from the dressing room a transformed side. Terence Carter somewhat fortuitously found team-mate Mahlondo Martin inside the box and he almost took full advantage, leaving both Richard Taundry and Hood on their backsides with some neat footwork before Josh Hutchinson drew a fine block from Breeden, who had come off his line anticipating the danger. Mace was then forced to head the dropping ball over the bar. Good approach play from Leamington saw Thompson-Brown exchange passes with Rowe before testing Boness with a well-struck low drive. A lovely flick from the midfielder then saw him set up Baker-Richardson, but his effort lacked the power to trouble Boness. After further Brakes pressure, Hayes & Yeading broke quickly with a long clearance from defence finding Weiss, who cut inside the retreating Hood before forcing Breeden into another good save. Rowe almost doubled his tally for the afternoon with a diving header from Thompson-Brown’s corner but the ball dropped just past the far post. The visitors then played their way through the Brakes defence with worrying ease, Hutchinson’s stunning strike drawing an equally good save from Breeden as he arched to tip the ball over his bar. A header from a corner was then nodded clear by Mace. Manny Adebowale tried his luck from distance with a powerful effort that was arrowing towards the bottom corner before Breeden got a vital touch, diverting the ball on to the post and behind. Brakes were still driving forward at every opportunity as the game swung from end to end and Obeng was sent tumbling in the box under a challenge from Martin. However, referee Mark Howes was not swayed enough to award a penalty. Edwards then nudged a free-kick into the path of Rowe who, six yards out, seemed certain to bag a third for Leamington only for Boness to make a superb block. Baker-Richardson was the next to be left wondering how he did not score when his dipping thunderbolt of a shot clipped the bar, but with time running out it was the two first-half goals that ultimately made the points safe for Leamington. Brakes: Tony Breeden, Richard Taundry (Ben George, 58), Connor Gudger, Darren Pond, Jamie Hood, James Mace, Courtney Baker-Richardson, Jack Edwards (Joe Magunda, 87), Ryan Rowe, Rob Thompson-Brown (Callum Gittings, 76), Ahmed Obeng. Subs not used: Tom James, Nathan Olukanmi. Hayes & Yeading United: Danny Boness, Brian Evans, Jack Kelly, Olu Durojaiye, Manny Adebowale, Tom Broadbent, Ryan Hope, Terence Carter (Jerson Dos Santos, 79), Mitchell Weiss, Josh Hutchinson, Mahlondo Martin. Subs not used: Mo Otuyo, Colin Mugoya, Dylan Kearney, Joe Debayo.